New full length album by Masta Ace. The entire album is produced by Kic Beats of whom Ace said ''he doesn't use many samples. He mostly uses live instrumentation and manipulates it so it has that warm/fat sample feel''. 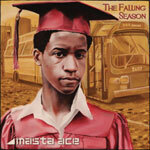 Like previous Masta Ace releases, The Falling Season is a conceptual work that follows him through his high school years. Guests include Chuck D, Hypnotic Brass Ensemble, Cormega, AG of DITC fame, Your Old Droog, Wordsworth, Stricklin, The World's Famous Supreme Team, Queen Herawin of the Juggaknots, Pearl Gates and Pav Bundy. Produced entirely by Kic Beats.